Cholera is endemic in many parts of the world. Substantial advances in our understanding of treatment, pathophysiology and immunology of cholera have been made but many aspects of cholera epidemiology remain obscure. In endemic areas of Bangladesh, cholera epidemics occur twice a year and have a regular seasonal pattern (Martin et al., 1969; McCormack et al., 1969; Merson et al., 1980; Glass et al., 1982; Samadi et al., 1983). 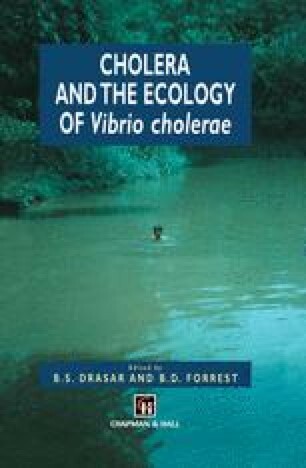 During epidemics, Vibrio cholerae O1 is isolated from both patients and from surface water, but disappears from the environment during inter-epidemic seasons (Khan et al., 1981). The reservoirs or sites of survival and multiplication of V. cholerae O1 between epidemics are not completely known (Islam and Aziz, 1981; Islam et al., 1988, 1989, 1990a,b).